A few months ago, I got an e-mail from a friend asking for a LinkedIn recommendation that went like this, “Yo, would you give me some props for that time we volunteered at SunLight." Here’s a guy I haven’t heard from in years, who I barely worked with, asking for “props” during the busiest time of my year. Not only was his request of a recommendation terrible, but a little bit of warming up might have helped convince me to say “Yes," which I didn’t say. If you want to know how he could have taken a better approach to asking for a recommendation, you can read my advice on asking for LinkedIn recommendations. If only the new LinkedIn Contacts product was out, because he could have followed these three tips to help himself stay current and ask for help more adroitly. Oh, by the way, if you don’t have the new Contact app, you can sign-up for the beta release. My friend’s failed request came out of the blue. Yet, I’m also sensitive to the fact that he probably has a large network. How can he possibly stay in touch with everyone, right? Glad to know I’m somewhere at the bottom! Don’t wait to stay in touch with your network only when you need them for a favor. 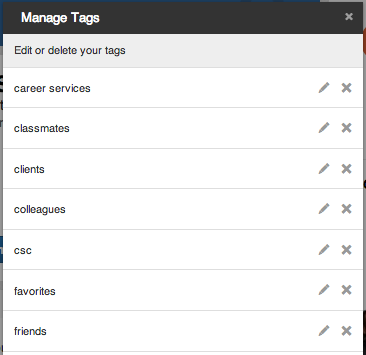 Rather, use LinkedIn’s Reminder feature to remind you to stay in touch off and on. Tip: Your more important contacts should hear from you at least once a month. Other contacts might not need to hear from you more than once per quarter. Go into your contact’s list and set yourself these reminders. 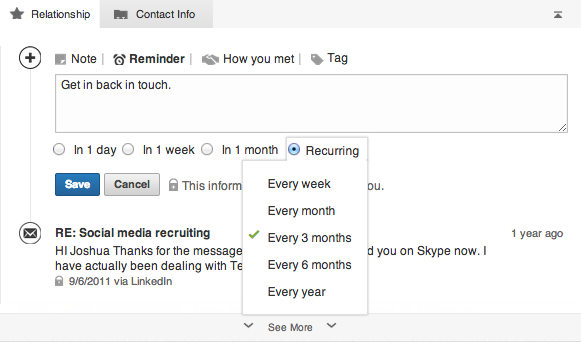 With LinkedIn contacts, your e-mails sent to that person can be found in their profile, like this: This means you can pick up where you left off in your last conversation. For example, three years ago, this friend of mine and I were talking about building a website together. The project never moved forward but our idea seems to have become popular, kind of an ironic and fun shared experience. Tip: By linking together past conversations with your latest correspondence, you help your contact see the context of your relationship. They are busy too and may need some gentle reminders about how they know you. Avoiding the pitfalls of coming across as “unprofessional” online. Positioning yourself as a “job magnet” - it’s not what you think! Exactly what you need to do to be found FASTER by recruiters and hiring managers. Ways to overcome (and even remove) some of the deadliest biases out there: age discrimination, unemployment, changing industries and more... and even leverage them into strengths! PLUS a Q&A at the end.